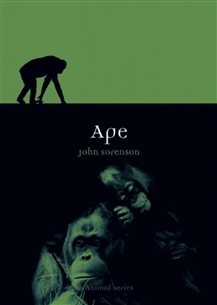 New in Reaktion's burgeoning "Animal" series, "Ape" relates the situation of the non-human great apes (bonobos, chimpanzees, gibbons, gorillas and orangutans), discussing how humans have imagined them historically and in modern times. We are both fascinated and unnerved by these creatures who are so like ourselves, and the book considers how we are committed to maintaining our difference from and superiority over the apes. John Sorensen examines how apes serve as models for humans: scientists use their behaviour to explain our fundamental nature, use them as tools in biomedical research, and devise various experiments to see to what degree they can emulate our own behaviour.He also looks at challenges to the division between the other apes and ourselves, describing ape language experiments and efforts to cross-foster apes by raising them as human children, as well as the ethical challenges presented by the Great Ape Project, which seeks to extend rights to these animals. "Ape" also considers representations of apes in popular culture, discussing films, advertising and zoos, considering how apes have been portrayed as caricatures of humans, demonic monsters and as clowns. It also looks at the precarious future of the apes, many of whom are on the brink of extinction, focusing on the 'bush-meat' crisis in Africa, palm oil production in Indonesia and the illegal pet trade, and also includes a discussion of sanctuaries that may offer some hope for their survival. Containing many appealing illustrations of our closest animal relations both in nature and in culture, "Ape" is aimed at a general audience, especially those interested in animal-human relations.